There's nothing worse than a stroppy chicken, as anyone who has ever been on the sharp end of one will tell you. I have personally been the victim of a chicken called Matilda McAlester (although I can't guarantee that she's not using an alias) who seems to have been holding a grudge against me for the last five years. She often comes round my house when I'm not there and stuffs feathers through my letterbox, and this can be terribly difficult to explain whenever I have friends over. Luckily I don't have any friends, so the problem doesn't arise, but it's dreadfully inconvenient all the same. The worst thing about this whole situation is that I have absolutely no idea why this fractious fowl has decided to pick on me. As far as I'm aware I've done nothing to incur her wrath, nor do I have anything against poultry in general. I can only conclude that she's mental. And this got me thinking. I am a firm believer in the idea that disruptive and antisocial behaviour is a result of upbringing and environment - especially when it comes to chickens - and I was certain that Matilda McAlester's problems stemmed from when she was an impressionable young egg. But what could possibly drive a young chicken to distraction? Then suddenly, as I was waiting for a number 52 bus to Doncaster, I had an epiphany! This caused some distress to the people waiting along with me, many of whom were elderly and infirm, and unaccustomed to finding themselves on the periphery of a major discovery. However, after I had made my apologies and seen off the ambulance, I had chance to reflect upon my sudden flash of insight. The driving rain beating on top on the bus shelter had made me consider the effects of rain drumming on the top of an egg. The constant din would be enough to send even the most stable of young chicks right round the chuff. Imagine being trapped inside a bottle bank, with Ringo Star hammering away on top of you day and night. Doesn't bear thinking about, does it? 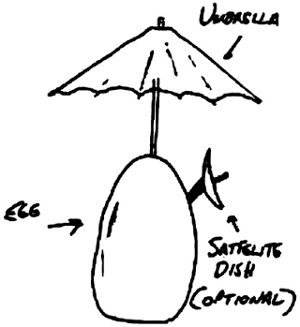 The solution seemed simple enough: fit each egg with an umbrella, thus protecting it from the elements. During my initial experiments I tried first welding, and then gluing the umbrella to the top of the egg, but these methods proved unsatisfactory. However, in recent weeks I have enjoyed some considerable success using rivets, and will soon be ready to unveil my egg umbrella to the world. This means that hopefully, in the not too distant future, people like myself will be able to go about their business free from the troublesome attentions of lunatic birds.